I have seen a few people with Chapter signatures on the forum. I was just wondering if anyone here had the skill and software available to make one for us. We would probably need a basic idea for the designer. Any ideas? Anyone able to create this? I see the peach a whole lot down here. Maybe a peach in the image. We are the state for The Walking Dead, I wonder what we could do with that legally. 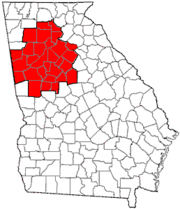 Lastly, we have a ton of counties here in GA and they are tiny compared to other states. We could probably do something with that too. Ha, I started playing with this after work today. Nothing to show yet, but I want to include something like "ground zero" alluding to the Walking Dead. I made the ZSRC logo and the flag-based pics in my avatar and for ZSC 025 and 026, but that style is about the limit of my skills. Davo wrote: Ha, I started playing with this after work today. Nothing to show yet, but I want to include something like "ground zero" alluding to the Walking Dead. It sounds like you know what you're doing. Ground zero makes me think New York to be honest. I'd say give this a few days and let the group brainstorm some slogans before you spend time on this. If I still had photoshop or illustrator I could probably whip something up. I love the idea of a unifying signature image. I'd also hope to get one made for a Facebook/Twitter banner, FB default image, etc. at some point for those of us who use that sort of thing. Passive recruiting technique right there. I'll brainstorm a bit at work. While I like the idea, I'm not sure how much input we're going to get this early on. "You never know when something will need to be stabbed after being shot repeatedly..."
I like that, but I still think it's too big... more tomorrow. I like that Terminus is some unspecified location near metro Atlanta, but not exactly associated with downtown. If Terminus doesn't appeal, we could use King County, GA, also from the series. For avatars. I could replace "SOUP'S ON!" with forum names or something. I really like this one, based on the seal of the city of Atlanta; too bad it will look like dookie if I make white transparent. If we use the "ZS" logo or the term "Zombie Squad", we need approval from the board, although I believe we can discuss possibilities and vote on designs, just not officially adopt them without approval. 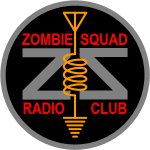 So, I have removed the words "ZOMBIE SQUAD" from my avatar, and it does not bear the "ZS" logo. Rules. Follow them or change them, I say. 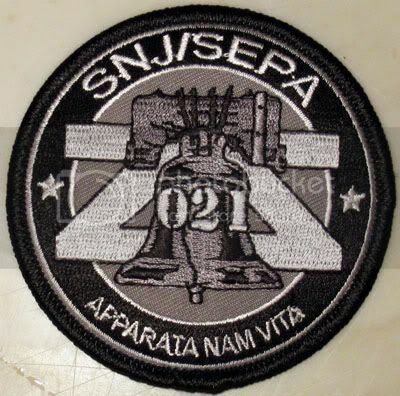 EDIT: You know, if we adopt a design (like the seal in my avatar) which uses nothing covered by ZS rules, we could just use the standard ZS patch below it. Separate patches, no modifications to ZS IP, no worries. I think we are still ok as long as we are working on it and not having it be official. I do like the idea of having a signature ready for when ZS016 becomes restarted again. Once we get ZS16 restarted there are a lot of things to work on like a FB group and such. We will need some images along with some photos of events for it eventually. I like the idea, and the designs so far all look good. I think it should be group decision as to whether or not we use the ZS name in it or not. I don't think we'd have any trouble getting it approved by HQ. Plus, having something with ZS in the image would help us as far as Facebook profile pics, banners, and Twitter pics and banners go. From a branding perspective it's kind of a necessity. I like the "Terminus" tie in, but I wonder how many would know that it was the original name of Atlanta when the railroad was built. We need something visually striking, either way we go. Terminus was also the name of the big cannibal camp in The Walking Dead. I know and I bet that is where most people know it from. Working with some older pictures and publications from this chapter, I've recreated what appears to be the main chapter's logo in high resolution, and tweaked to match the style of ZSC-001's logo (ZSC-016). This is scaled down to 800x527, from the original 2816x1856 which can be used for printing. Alternatively, here is the logo as close as I could make it to the original design, with ZSC:016 flipped 180. Personally, I think the first one is easier to read, and it matches the Saint Louis design. Next, if y'all like this design, we can submit it to HQ for approval. edit: for some reason the forum doesn't recognize the resolution of the image, and therefore won't even try to display it. Instead I've remapped the above resolutions as links. Last edited by KJ4ZDD on Sun Jun 21, 2015 12:17 pm, edited 1 time in total. I like it. In the past (years ago, not sure if it's still valid) a logo like this was instantly approved by HQ for any chapter. I'd still run it by them if we like it. But we could throw it on... well... anything. Shirts, hats, stickers, patches. Whatever. However, if we wanted something more elaborate, I'm all for that too. Side note: At our reinstatement event planning meeting a few months back, we decided that "Greater Atlanta" sounded less geographically restricting than "Metro Atlanta", so we officially listed our region as "Greater Atlanta", and that change should be reflected in our subforum description soon (I hope). Granted, there are several instances of other groups using the term Greater Atlanta, such as Re/Max real estate(it actually uses both terms), the Girl Scouts, the YWCA (YMCA uses Metro Atlanta), and the Urban League to name a few. I'm also pretty sure the name of our area only needs to be the point from which a 2-hour drive will include members for our area. Like ZSC-001, Saint Louis includes all of the micro cities around it, we could probably get away with just "Atlanta", but we're stretching that starting point to the outer borders of the massive "Metro Atlanta" to include nearly the entire northern half of Georgia. This also means I'd have to shrink down the font size of our name to fit it into the same space. And can you imagine how long it'll take HQ to not only change us from INACTIVE on all their listings, but also change our name? But oh well, here you go: Greater Atlanta ZSC-016 jpeg, and again in full size tiff. We didn't want to make some people feel excluded simply because of the name of our chapter. If we said "Atlanta" or even "Metro Atlanta" then some people who are not right in the city might not get the message that they are welcome. Heck, even Hard Labor Creek State Park and Charlie Elliot are a ways outside the city, and I wouldn't consider those places Atlanta. But it's up to us, and you're right. Whatever we call our region, it will still encompass that same two hour area. It is our chapter, so if we feel we need to change the region we can put it to a quick vote and i doubt there will be any fuss from higher up as to changing it. If that's something we want to do, or are even interested in discussing, it's something we should do at our next meeting. I'd had to get logos approved and patches and shirts printed and then decide to change the region and have everything say the wrong region, haha. I like that. Can we get one of those printed and working for the tables? I am not familiar with them other than that I see people take a photo of it with their phone and it pulls up a website. But I am not sure how to get that to work. I also let them know of the bitly shortcut, http://bit.ly/1fksksz, which also points here. This is going along with the proposed name change. And, I've come across an old logo that was actually professionally printed on some t-shirts back in 2009. I've scanned it, and submitted it, asking if anyone in HQ can come up with who originally came up with it, and what we can do with it today. It would be awesome if we could use something like this as our own t-shirt logo again, with the ability to print our own shirts and sell at tables for some form of operating fund. This one can be paired with the existing ZS image without modifying it; requires no approval.